The Japanese knew about sous vide long before the Brits or the French and onsen tamago is one example of slow cooking food in an enclosed container. Modern chefs who are into molecular gastronomy like to think that they can apply their high school chemistry and physics, and the sous vide cooking of meat in plastic bags at very low temperatures for 2 days or more to get a tender texture and 'original' flavor is gaining popularity in restaurants although I'd stay ten miles away. I just won't touch plastic-cooked food whether or not they are guaranteed to not leak into my food. That's the reason I only have one non-stick pan. Onsen tamago are eggs cooked in hot springs, such as those on the foothills of Mr. Fuji. Japanese restaurants serve onsen tamago too but instead of hot spring water, trays of eggs are kept for a long time in warm water. That is all I could extort from a waitress at Nishiki Restaurant, the only place in KK where onsen tamago is served. Interestingly, I've eaten Mt Fuji eggs twice, and both times they were hard, maybe because the spring waters were too hot. They weren't any more delicious than regular boiled eggs and they stank of sulphur. If you love half-boiled eggs but the thought of eating raw yolks makes you queasy, onsen eggs are the answer to your agony. 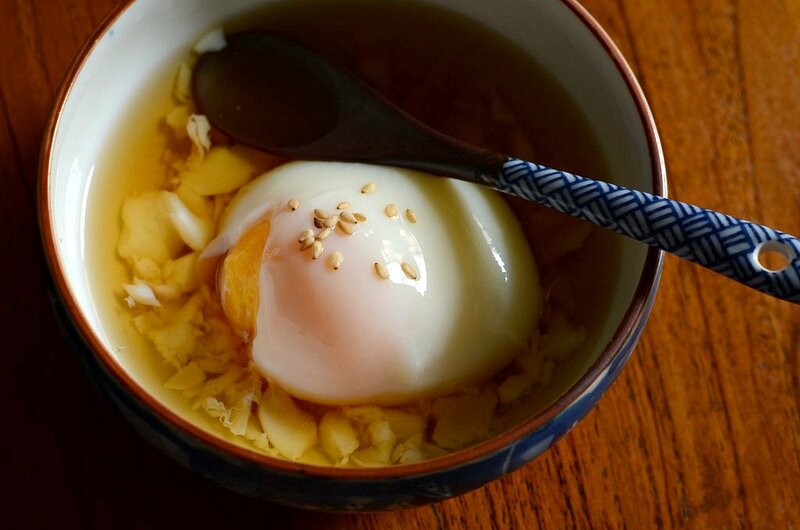 Onsen eggs are in fact half-boiled eggs in reverse, eggs with cooked yolks and runny whites. I find it rather strange and sometimes wonder if the eggs are delicious just because they are reversed. But then I take a spoonful of the egg, a bit of cold, smooth, silky white and a bit of the firm yellow and I know that it's not the novelty of the unusual egg but the damn deliciousness of it. Of course the light dashi soy sauce adds to the taste but if you've eaten a good organic half-boiled egg, imagine it twice as delicious and you'll sort of know what I mean. 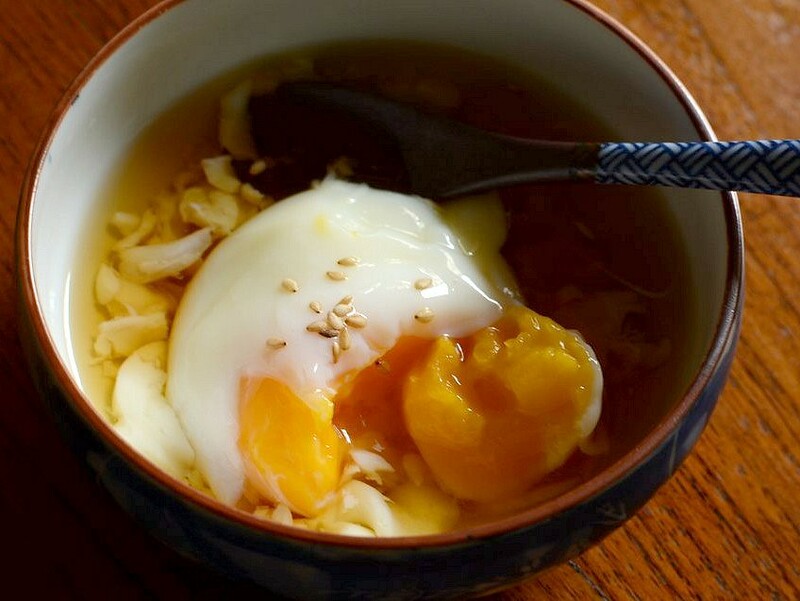 The reason for the reversed state of boiled onsen eggs is egg whites are made of mostly protein (albumin) and coagulate at a higher temperature than yolks. That's why when you boil an egg, the whites set before the yolk. Of course the fact that the yolk is in the center means that it doesn't get as much heat. However, when you cook (not boil, technically) an egg at a temperature to just set the yolks, you'll get a firm yolk and a runny white. The Nishiki waitress said that the onsen eggs were cooked for 45 minutes but couldn't--wouldn't--tell me the temperature of the water so I did a bit of googling (Google is the best thing ever!) and found that the recommended temperature is about 65 to 70 C. How long the eggs are to be cooked depends on the size of the eggs. I can measure the weight of my eggs but I can't measure the temperature because I don't have an cooking thermometer. The best method would then be to cook the eggs in the oven. Oven tempratures however are not accurate, with some ovens ranging + or - 15 degrees off the set temperature. 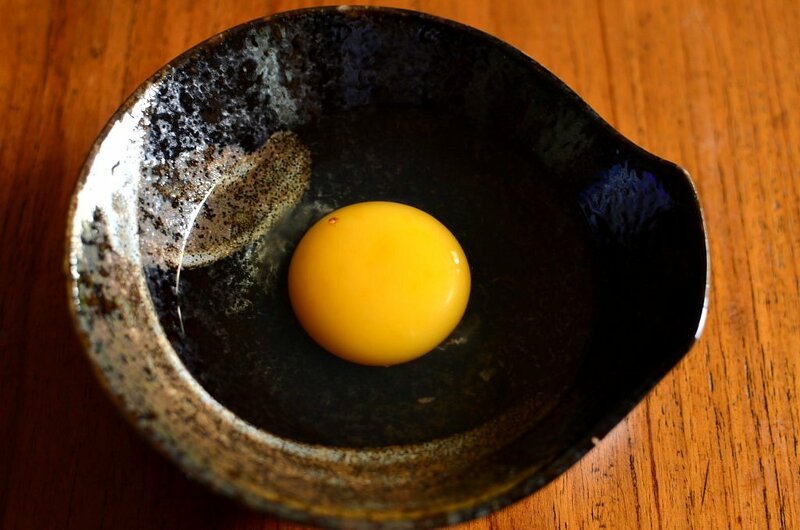 For an near-scientific onsen tamago recipe, go here. It's a very interesting article and the site is just amazing; I love it. Based on the results posted in the article, the best onsen eggs were boiled at 64.4 to 66.7 C for 75 minutes. It's a raw egg! I wasn't surprised because I started with room temperature water, since I don't have a cooking thermometer. I put the pot back into the oven. I have to go out for lunch now. I'll be back maybe two hours later. Will my eggs be reversed? The white is still not fully set but the yolk is quite firm and cooked. If I had checked on the eggs at 45 minutes, I probably would've got the perfect onsen egg. I'm happy though because I've wondered about reversed boiled eggs for years. I think that if I have a cooking thermometer, I can make perfect onsen eggs in 45 minutes. 1. Preheat the oven to 70 C. Great if you have a reliable cooking thermometer. 2. Fill a small heavy-based pot with a tight-fitting lid with enough water to cover the eggs and heat it up to about 65 to 70 C. Put the eggs into the pot and cover with the lid. 3. Place the covered pot into the oven, middle position, and leave in the oven for 1 hour. 4. Meantime, mix a little bit of dashi granules with hot water and stir until granules are dissolved. Add some light soy sauce and dilute the sauce with water to taste. Chill in the fridge. 5. When eggs are done, put them in cold water to cool and then crack into a bowl and ladle some sauce over. mich: i dunno, i like plain old high heat searing and grilling for my steaks and the new methods smthimes are too gimmicky you know? but then i'e never had a sous vide steak. Wow terri, what will you be up to next? heh heh. Didn't know this could even be done in the first place. Ok I'm gonna try this some day. WOW. These look absolutely fantastic. They look so good already can't imagine them being EVEN better with a cooking thermometer! I, too, am always exasperated at my cooler/inaccurate oven temperature. So confusing, sigh. But slowly getting the hang of it, I guess. Really cool post, love this!! Wow, who knew plain eggs would look soo good! Yes, onsen tamago is a favorite of mine but I have never tried cooking them at home...I never knew that it takes an hr to cook it! In Japan, you can find the onsen tamago in almost any supermarket. They come in packets of 4 or 6 with the sauce attached. Its cheap and easily available so I think that's why many Japanese restaurants dont serve them because people can buy and have them at home. If you go to Japan, just walk into any supermaket and you will find it though not in the eggs section but in the chill section. BTW, when are you going to Tokyo? We are planning to go in April and you know what...MAS has cancelled all their direct flights from KK to Japan from Feb..so inconvenient! Hope there will be an alternative soon. brook: it's a bit tricky but can be done if you have a thermometer. try making it! winston: have you eaten these eggs before? nishiki serves them as appetizers, free. rina: MAS is just crazy, changing its routes every now and then. didn't they just start the route frm kk to perth just last year n now they have stopped it. and just last year too they set up firefly and within a year they folded the company. i'd love to go see the sakura but april may be a little too late for tt? I used a slow-cooker (crock pot) because it maintains temperature at 74-77 C for around 30-45 mins. It came out perfect. The eggs needs to be at room temperature. Switch-on the slow-cooker at 'high', wait for it to be heated for 5-10 minutes, put boiling water into the slow-cooker, put the eggs in, turn the level to 'low', leave them there for around half and hour (you may have to adjust the time according to your cooker).